I created this back in February at the Scrapping Escapes Retreat in San Diego and never got a chance to share it with you. Figure I better post it before someone buys it from my ebay store. I took a cardboard take out box and re"vamped" it using yummy papers, stickers, flowers, bling, ribbons, and of course some glimmer mist. This is sure to brighten any Twi-hard's day. I designed this layout for my kit of the month..I love it! Hope you do too! I used bazzill and cardstock as well as Storytellersclub printed paper. I used Cricut Cart George for the stars. Independence Day was used for the title, banner, Statue of Liberty, and the large fire cracker. Stand and Salute was also used to make the smaller fire cracker. I added some ribbon stapled in the center of each banner piece and may add some stickles later on. 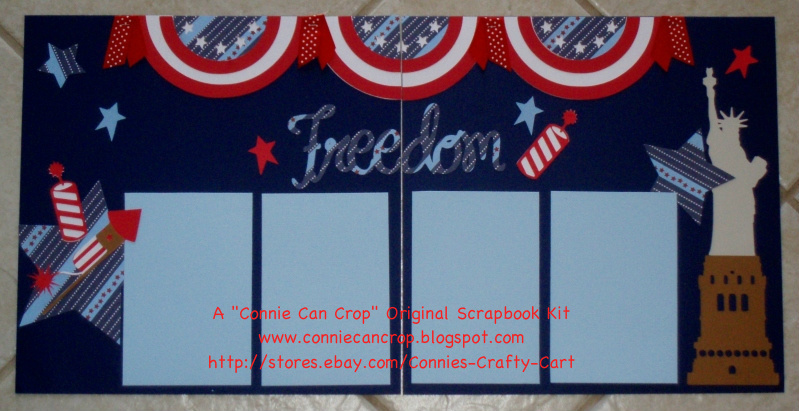 It can be used to celebrate the 4th of July, Memorial Day, or even to honor your favorite military man or woman. I hope you enjoy this layout as much as I enjoyed creating it! All my crafty friends need to come check out My Craft Channel, featuring Teresa Collins! It's so exciting! What is My Craft Channel? My Craft Channel is the first of its kind online TV Craft Network. It goes beyond the simple web “how-to” home video & delivers broadcast quality programming. Over 20 new shows each week there is something for everyone. Top experts, bloggers & craft celebrities in various niches from sewing, painting, scrapbooking, DIY projects, photography, mixed media & more have joined together to bring education to the WEB with TV formatted shows. Don't Forget 2 Days Left!! Don't forget to you still have 2 days left to leave me some love. Just be sure you leave a comment on my blog under the Blog Candy Post below and become a follower. Tell your friends! Someone is gonna win 5 great Storytellers Club Kits. This layout was actually started while on vacation last July in Colorado while visiting my sister. It was some goodies given to us by Archiver's(which is such a great store and needs to come to California asap!!). I am so glad to finally have it finished. I hope you enjoy it! And did I mention Gypsy Leashes!! I was asked to create an attachable charm for a friend. She was always losing her stylus pen and wanted something that would attach to the stylus and to the Gypsy too. So here is what I came up with. The one below is mine and Yes it is one of a kind. This is a beautiful pink and silver leash. The silver charm is made so you can add a photo of your special someones. Don't like pink? I can make it in many other colors too. My Breast Cancer Charms are probably my number seller so I felt it only appropriate to make one into a leash. The cancer ribbon has tiny pink bling rhinestones. So pretty! And here again is another pic of mine just so you can see how they look attached. I have several more in the works and I customize them for you too. Just stop by ebay store and check out the many designs of Connie's Crafty Charms! I have been busy coming up with new designs for my Gypsy Stylus Charms. Decided we needed some princesses and fairies! Please feel free to check out my ebay store for many more option. And remeber I can make you one to order, just let me know what colors and what charm. I created this layout for my June Kit of the Month. Kind of late, I know, but I didn't have a kit in April or May. I used several different Cricut Carts, cardstock, ribbon, paper from Storytellersclub, brads, and bling. I think this bunny and chick are adorable! What do you think?